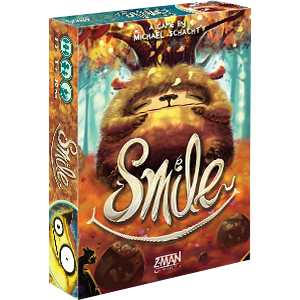 Z-Man Games is happy to announce Smile, a card game for three to five players of rounding up the critters worth the most points. Dusk is falling and your critters have escaped their enclosure! You only have a few hours to rescue as many as you can before they cause all sorts of mischief. Fortunately, critters will do anything for a big juicy lightning bug. It’s time to fill your jars with fireflies and head into the forest. Armed with firefly-filled jars, you and your rivals spread out in search of the lost critters, each hoping to lure as many as you can. But be careful not to lure any wild critters by mistake! They look very similar to your tamed ones, but capturing them gives you negative points. Your goal is to be surrounded by a collection of cute little smiling creatures no matter what—just make sure to get the right ones! Smile is a game of making bold bids and crafting devious plots to claim the critters worth the most points. With the critters out of their enclosure, you have a golden opportunity to round up the best ones for yourself. But keeping them out of the other players’ hands won’t be easy. Choose when to make your move and when to hold back if you want to claim the cutest critters as your own. 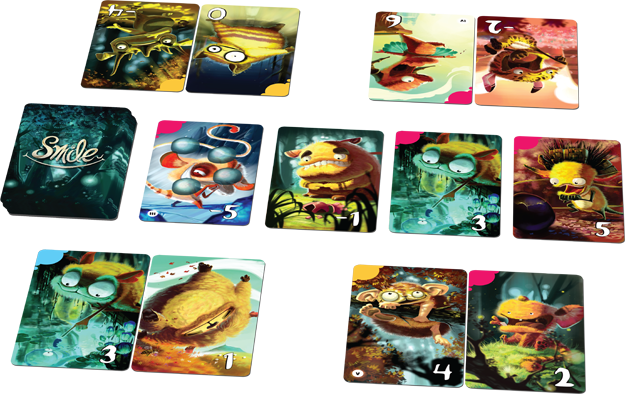 During each of the game’s ten rounds, critter cards equal to the number of players are revealed from the deck. Players then compete to lure the available critters by offering up fireflies. 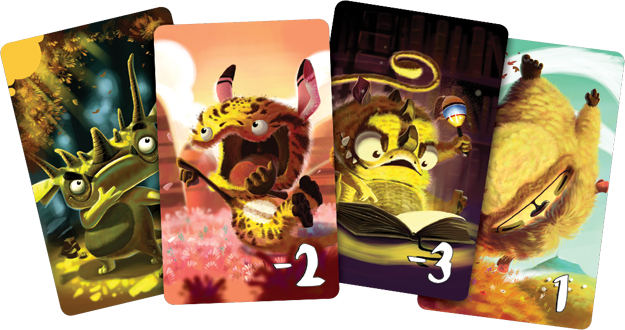 On their turn, each player can choose to either stay in the round or bow out and collect a card with at least one firefly on it. To stay in the round—and remaining in the hunt for the most valuable critters—you must place a single firefly on the creature with the lowest value. As a result, dropping out of the round means settling for fewer points while gaining all the fireflies on the card you take. Playing a round of Smile, then, is a subtle game of deception and pushing your luck. Each firefly you commit brings you one tantalizing step closer to a valuable critter, but also moves you toward depleting your supply of the precious bugs. Play carefully to maintain a steady supply of fireflies and stick your friends with critters worth negative points, while biding your time for the critters worth big points! Each round of Smile affects the next, opening all sorts of devious strategies. You could drive up your opponents’ bids on mediocre critters early on so that they don’t have enough fireflies to compete for better ones in later rounds. Or you could amass a horde of fireflies early and use them to make a dramatic comeback by outbidding your opponents in the later rounds. No matter what approach you take, Smile gives you subtle ways to affect what critters you—and your opponents—wind up with at the end of the game. For example, if you ever get two critters with the same color in the top-left corner, you remove both critters from the game. This means that, if you play skillfully enough to nab the right critters, you can eliminate your cards worth negative points. Or you could be even more devious and leave an opponent with a critter that forces them to discard some of their valuable cards. This also means that all players’ motivations will shift with each new round. As the game progresses, different critters of different values and colors will be more or less desirable to players depending on the critters they’ve already collected. Deduce the critters most valuable to your opponents and you’ll gain a significant advantage. The light is falling and time is growing short. There’s no telling what sorts of trouble your critters will get into if you don’t find them soon. Gather your lightning bugs and round up the best critters in Smile, arriving soon!